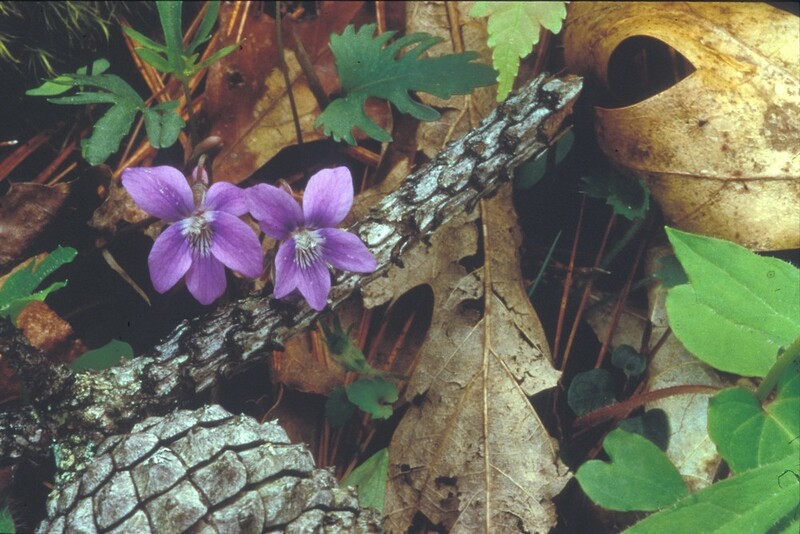 Wood violet has very variable leaves, being more or less lobed, with indentations of varying depths. This is a species of drier sites, forests, rocky slopes and fields. all the leaves lobed and petals without hairs on the inner surface (vs. V. palmata, with the first series of leaves unlobed, the later leaves lobed, and lateral petals with hairs on the inner surface). all the leaves lobed, the midseason leaf blades with 5-16 lobes that become progressively smaller and separated by shallower sinuses toward the basal margins (vs. V. palmata, with the first series of leaves unlobed, the later leaves lobed, the midseason leaf blades with mostly 3-5 lobes). 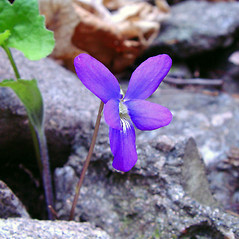 Viola palmata var. dilitata Ell. 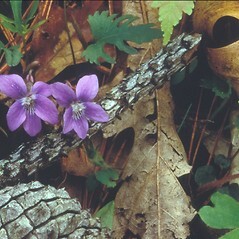 wood violet. 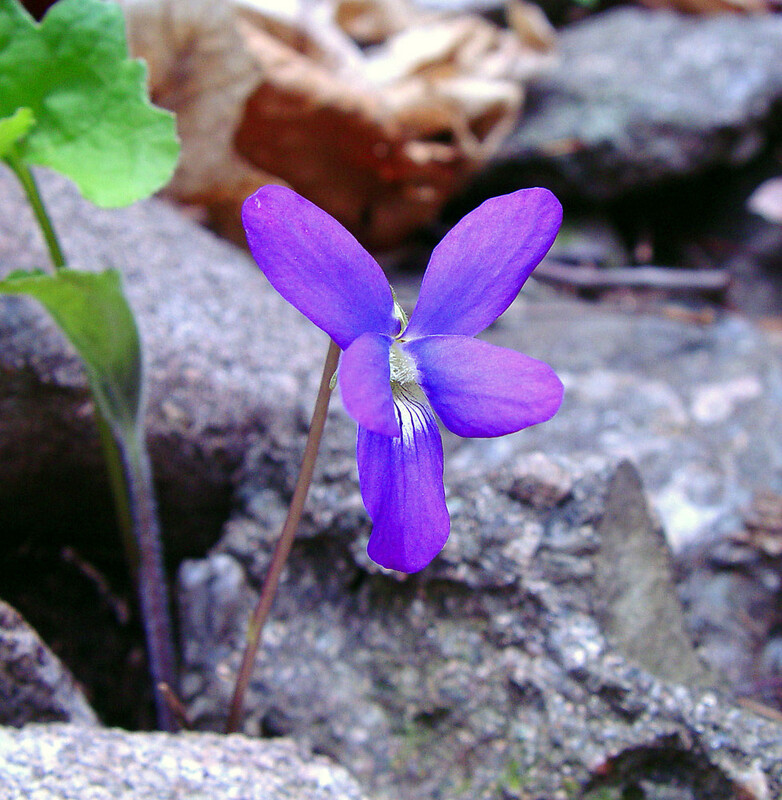 Viola palmata L. var. dilatata Ell. ; V. triloba Schwein. • CT, MA, ME, NH, RI, VT; restricted in northern New England to southern ME and NH and western VT. Dry-mesic forests, woodlands, clearings, rocky slopes, and fields. 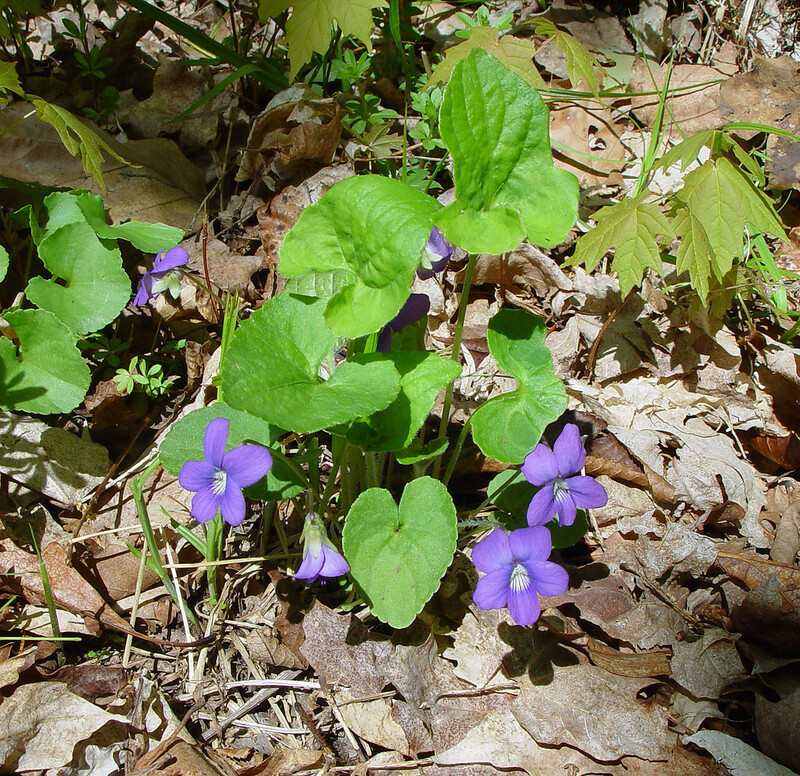 Rare forms of this plant have deeply cleft blades (the dilatata form) and could be confused with Viola subsinuata. These can be separated by their 3–7 principal segments, unlobed middle lobes, and occasional presence of petiolules on the outer (i.e., lower) pair(s) of segments (vs. 5–16 principal segments, lobed middle lobes, and absence of petiolules on the outer pair(s) of segments in V. subsinuata). The dilitata form is known from CT and VT.
16×25a. Viola ×‌robinsoniana House is a very rare violet hybrid known from CT, MA, NH. 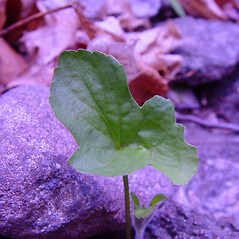 It has pubescent foliage and narrow-ovate to ovate-oblong leaf blades, some with 1–3 lateral lobes near the base and a prolonged middle lobe (the first leaves and late season leaves unlobed). It differs from V. palmata in the relatively narrower leaf blades and reduced lateral lobes. It differs from V. sagittata in its relatively broader leaf blades and more prominent lateral lobes. 7×16. Viola cucullata × Viola palmata → Viola ×‌greenmanii House is a very rare violet hybrid known from CT, MA. 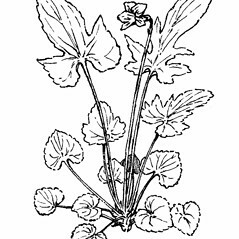 It is a sparsely to moderately pubescent plant with variable leaves—some unlobed and some with small lateral lobes and a large middle lobe. The cleistogamous peduncles are variably prostrate to ascending, and the cleistogamous flowers have few (if any) cilia on the sepals and rather elongate sepal auricles. 7×25a. 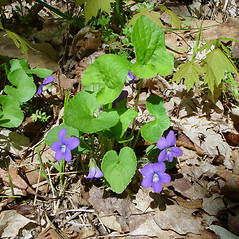 Viola ×‌porteriana Pollard is a rare violet hybrid known from CT, MA, ME, NH, VT. 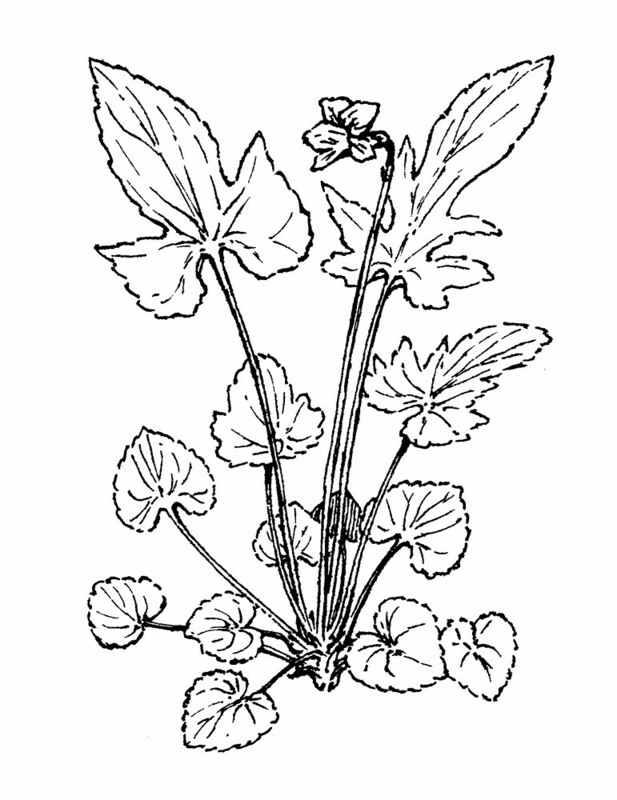 It is a sparsely to moderately pubescent plant with narrow-ovate leaf blades, which are transitional in shape between V. cucullata and V. sagittata var. ovata. The sepals usually have some cilia (at least on the auricles), and the petal hairs are often slightly expanded at the apex (i.e., intermediate between the two parents). 16×27. 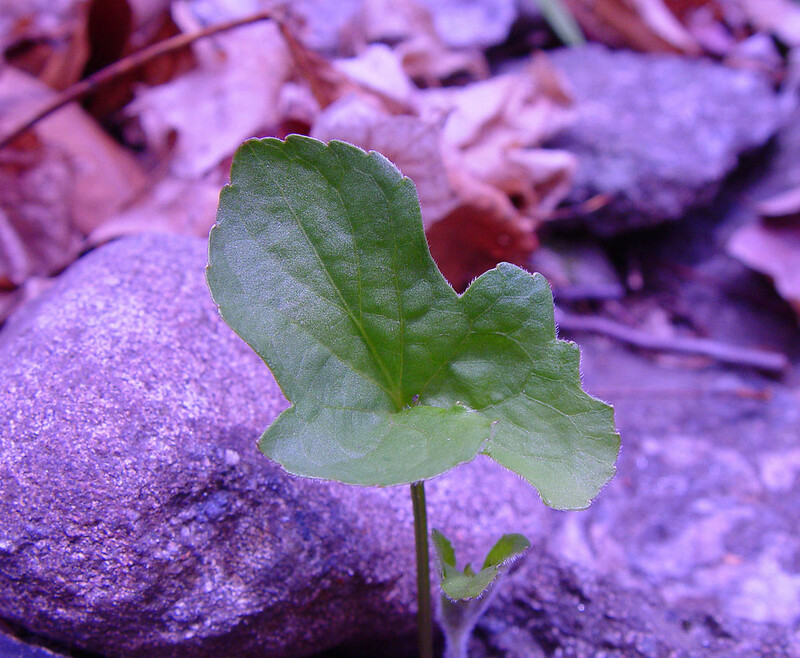 Viola palmata × Viola sororia → Viola ×‌populifolia Greene is a very rare violet hybrid known from CT, MA, VT. 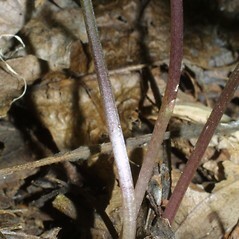 It has pubescent foliage, and usually some of the leaf blades show obscure lateral lobes separated by short sinuses (the first leaves and late season leaves are unlobed). 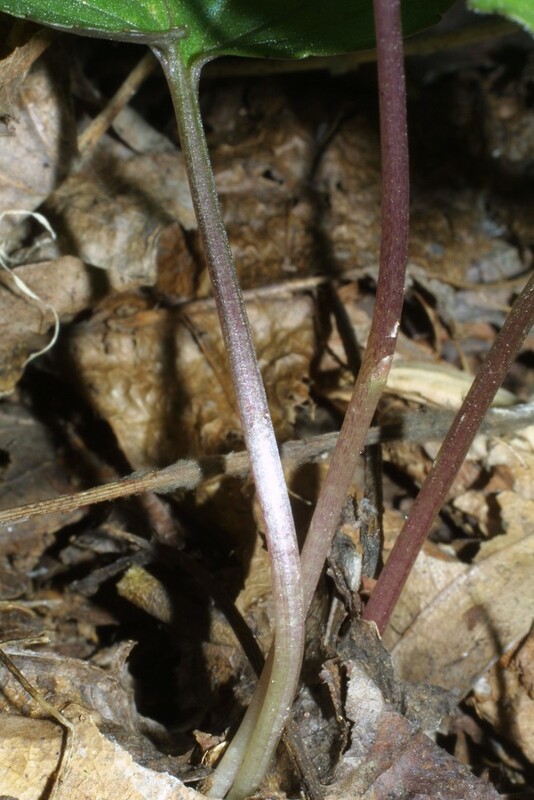 Some forms of this plant (including the type of Viola populifolia) have broad-ovate leaf blades with a shallow basal sinus, a form that could easily be confused with V. sororia, but the cleistogamous capsules will show very few well-formed seeds. Such plants usually also show a broad, but shallow, indentation on each lateral margin of the leaf blade, suggesting a very weak lobing of the blade. 16×29. Viola palmata × Viola subsinuata → Viola ×‌variabilis Greene is a very rare violet hybrid known from CT. It has pubescent foliage, often showing the first few leaves without lobed blades (as in V. palmata), and subsequent leaves with 5- to 7-lobed blades that are more similar to V. subsinuata, and the lateral lobes are broadly dilated and without the characteristic, progressively smaller lobes toward the basal margins of the leaf blade. Late season leaf blades of this hybrid may be scarcely or not at all lobed.